This is what you see when you enter the new headquarters of the LightHouse for the Blind and Visually Impaired in San Francisco: After passing through glass doors and entering the lobby, your eyes are drawn across the reception area and the sofas and chairs neatly arranged next to it, before coming to rest on a large, modern staircase on the far side of the room next to windows that look out on the cityscape. This is what it’s like to enter the space if you can’t see: After the glass doors swing silently shut, you enter an insulated space where the acoustics have been purposefully engineered so that you can hear the receptionist welcome you from across the room. The new $20 million LightHouse, which opened its doors in June, was designed to be a multisensory beacon of community in the lives of the people it serves — those with little to no vision. It’s also an example of universal design and an innovative workspace for the blind and sighted alike. This was one of the questions LightHouse CEO Bryan Bashin asked himself in the early design process of the new headquarters. The LightHouse had already gone through more than a few transformations in its 114-year history. The non-profit started out as a reading room for the blind in a San Francisco library. By 1918, it was a workplace for hundreds of blind people who made products such as rattan furniture, baskets, redwood planters, brooms, and industrial-strength rope and cable under the brand “Blindcraft.” The goal then, which was revolutionary at the time, was to reduce the high unemployment rate among the blind and enable self-sufficiency. After WWII, the center became a rehab center and classroom for returning soldiers, teaching them life skills like how to read Braille. Today, the core mission of the Lighthouse is to teach and empower the blind community, in the Bay Area and beyond. Under Bashin’s leadership, another goal is to connect tech designers with the millions of blind and visually-impaired people who could benefit from more inclusive technology products and services. On a deeper level, the place provides opportunities for the newly-blind to find mentors and role models. The idea of community is especially important to Bashin. He was a full-sighted kid. Like 95% of blind people, he lost his vision as an adult, and credits the blind people he met at the time with helping him enter into blindness in a way that made him feel positive and self-confident. And that’s what he wants for others. The design solution for this at the LightHouse was to dedicate a lot of space to chance encounters. 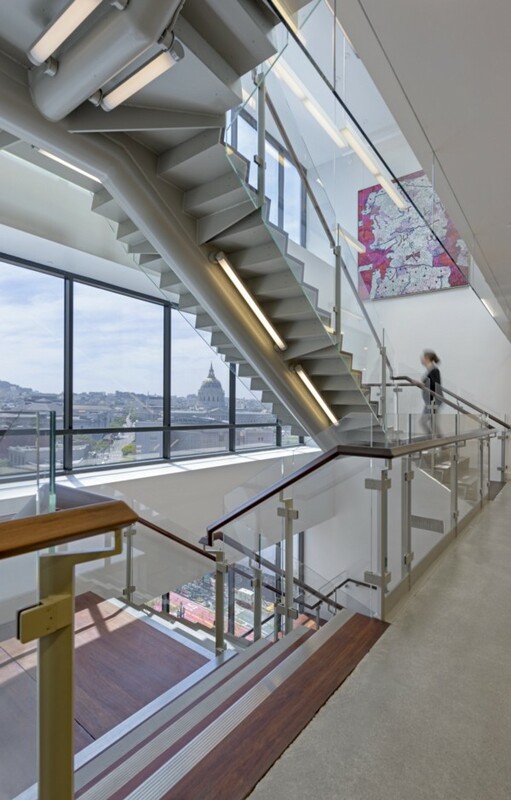 The non-profit is spread out over the top three floors of an 11-story building. On each floor, there is a prominent lounge space full of comfy couches and chairs. The LightHouse still offers life skills classes such as cooking basics, how to walk with a white cane, and more advanced courses like ProTools for blind audio engineers, but for Bashin, the most important lessons aren’t learned in a classroom. Part of the magic of the new LightHouse comes from how it was designed to be inclusive of all people. In reality, as Downey knows firsthand, there are many variations of the human experience. He was a practicing architect for 20 years before a 2008 operation left him without his sense of sight or smell. Since then, he has specialized in architecture to accommodate the blind. He’s also a LightHouse board member and teaches universal design at UC Berkeley, which is the design of products and environments to be usable by all people. In the case of the LightHouse, the architecture is bending to accommodate people, as opposed to people having to bend to accommodate to the architecture, he says. 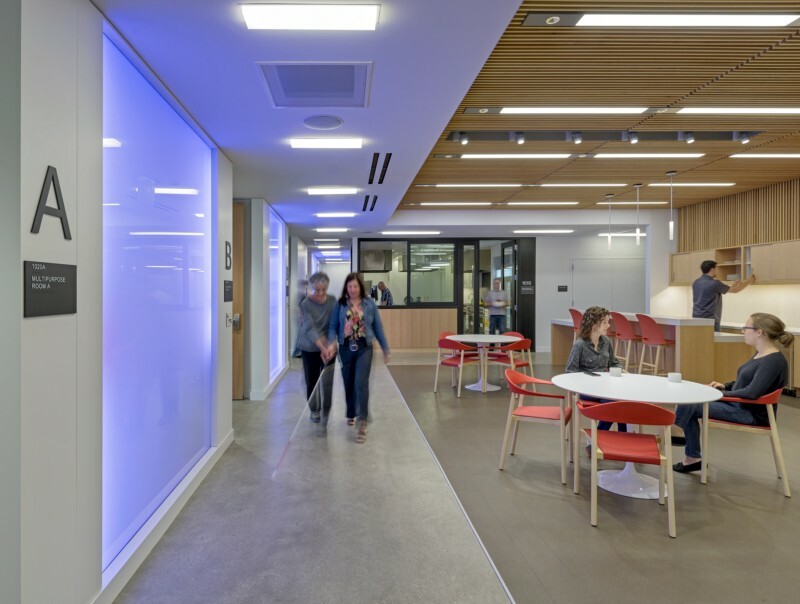 Examples include the attention paid to the level of lighting, more accessible signage, and all the intentional acoustics designed with audio engineers so the blind can experience the space through sound. It’s accessible to the blind, people experiencing hearing loss, or both, and those with mobility impairments. “We assume the broadest range of human experience as we can for the space,” he says. Unsurprisingly, given all the attention put into the acoustics of the new LightHouse, it’s the most common thing sighted people comment on when they visit and experience the space through more than just their eyes. 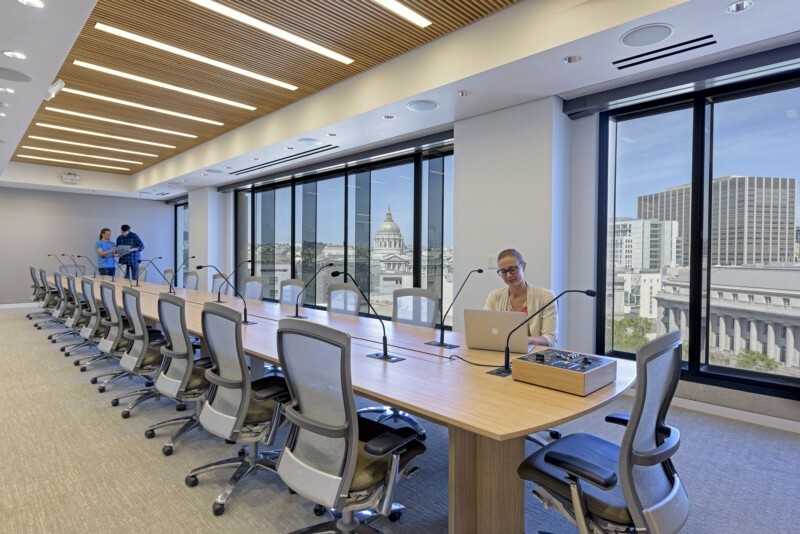 There is the absence of sound in some areas, like the incredible silence in the glass walled-meeting rooms, thanks to extra thick windows, and the wooden slats on some walls and ceilings and colored German felt on others that help insulate and control sound. In other areas, like the open offices and lounge spaces, voices and energy drift out and infuse the LightHouse with life. Downey sees this attention to sound as a lesson we could learn. Emily Brady loved learning that in LightHouse cooking classes students are taught to listen for the sound of water boiling.